In this eye-popping Star Wars print, this looks like a job for Han Solo! 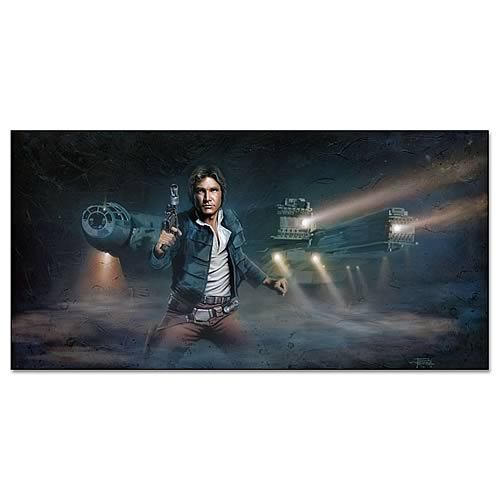 Spectacular Han Solo Paper Giclée from fan-favorite artist Brian Rood. Right out of Star Wars: Episode V - The Empire Strikes Back. The captain of the Millennium Falcon is a limited edition of just 100 pieces! In this eye-popping Star Wars print, this looks like a job for Han Solo! It was a dark and stormy night, and Han Solo was investigating a strange noise outside the Millennium Falcon… Star Wars fans all know what happened next in Star Wars: Episode V - The Empire Strikes Back, and now you can memorialize the moment with this spectacular Han Solo Paper Giclée in your very own home! From fan-favorite Star Wars artist Brian Rood, this true work of art measures 10-inches tall x 20-inches wide, is limited to just 100 hand-numbered pieces, and includes a certificate of authenticity. Make a place for this one!